Some and eventually more than all of Monday’s gains in gold were handed back by speculators this morning as a further rise in the US dollar and a hefty slide in crude oil made life a tad more difficult for the bulls in the yellow and white metals. Spot New York dealings opened with a loss of $11 in gold and a bid-side quote at the $1,650.00 pivot point. Silver fell 14 cents to start off the session at $30.35 after having itself nearly touched the $30 pivot figure in early dealings. Greek debt-related angst continues to keep the markets unsettled and Monday’s 250+ point slide in the Dow has brought the specter of margin call-related asset sales back onto the front burner. Gold fell to under the $1,620.00 level by 11:30 AM in New York as players unwound positions in a hurry even thought the dollar slipped away from the 79.50 mark and even though oil leveled off at $77.50 per barrel. The general tilt in gold remains aimed towards lower levels for the time being. We would also advise keeping a permanent focus on the resurgence of… mine hedging. 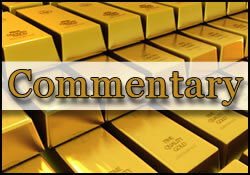 The opposite phenomenon has been clearly known to be a major contributor to gold’s price gains over the past decade. Well, now, GFMS/Thomson Reuters reports that the world has seen its second consecutive quarter of net hedging. While the amount (six tonnes) is still relatively small, the fact that such a paradigm has not been manifest since 2001 should speak volumes to those who kept banking on mine de-hedging to continue to buoy gold prices indefinitely. It might just turn out that the diggers have begun to feel that their own CEOs’ calls for mega-priced gold could be… over-optimistic. The S&P 500 index is now under the 1,100 mark and talk of bears prowling around is once again manifest among analysts. The $13 or so trillion that has been wiped off the value of global equity markets since the skies darkened this summer is not going unnoticed by the investment or the market analytical communities. Talk of deflation is once again making the rounds among economists. Platinum fell an additional $28 to open at $1,478.00 while palladium managed a $1 rise to open at $585.00 the ounce. Yesterday’s robust US car sales tallies has thus far failed to ignite much bargain hunting among noble metal specs as has the near-$200 premium in gold against platinum; a whopper of some proportions. Speaking of things automotive, Ford Motor and the UAW reached a tentative agreement that might see the creation of 12,000 hourly US-based jobs by 2015. Black gold was seen trading at a one-year low of $75.27 and showed signs that point to aggravating fear among specs on the back of news that Libya’s oil spigots are being almost fully reopened and that Goldman Sachs has revised its Brent crude projections for 2012 to lower levels. The dollar remained higher on the trade-weighted index and traded at 79.66 to 79.75 in morning dealings. Goldman Sachs’ crystal ball department also issued revised estimates for global GDP growth today. Unsurprisingly, the projections call for a lower level of economic growth around the world this year and next. Former estimates had 2011’s global GDP reaching the 3.9 level; that has now been scaled back by one-tenth of a percent. Next year’s global output might only come in at the 3.5% level after previous projections had placed it as high as 4.2%. The blame for such toned down estimates is being placed on the European situation. However, do note that 3.5 or 3.8 percent global GDP growth is still… growth and not the dip into negative growth territory that is all the rage these days when it comes to predictions for 2012. The US, in GS’ estimation, is slated to grow at about the 1.7% level this year and at the 1.4% one, come next year. That’s certainly not the previously projected 2% rate of expansion, but it is not a "double-dip" paradigm either. A couple of days ago we posted commentary expressing concerns about the effects that certain trip-and-falls might have on China’s economy and possibly that of the planet. This morning, a Bloomberg New editorial picks up where we left off and warns that the Chinese economic miracle model has its limits and that the country’s leadership — while well aware of the situation- will have to do some heavy-duty acrobatics in order to avert undesirable (some say horrific) outcomes. To wit, and just for one telling example: the IMF figures that the importance of Chinese demand on the planet’s largest economies (the US, Europe, and Japan) has more than doubled over the last ten years. Do not, for a nanosecond, underestimate what the adverse effects of the advent of a Chinese hard-landing would be on the commodities’ (including gold) space. Speaking of that space, at least in the opinion of certain market observers as well as some academics, the rate at which it has expanded, places it in competition with Edwin Hubble’s bubble-like universe. The Financial Times’ Mark Williams identifies gold ETFs as a potential "wrecking ball" to the market in the event a synchronized stampede towards the single "Exit" door were to occur. Professor of Economics L. Randall Wray, the author of "Understanding Modern Money" goes one step further and labels the recently intensified commodity market speculation as "The Biggest Bubble of All Time." In his devastating expose of the commodity sector, Prof. Wray argues that the tell-tale sign that the commodity bubble is light-years (pun intended) ahead of the Tulip Mania or the NASDAQ ones is found in the doubling of prices of the top 25 traded commodities just in the period of from 2004 to 2008. The top 8 commodities of course increased much more than that mere doubling of value. Now, it could be argued that the implosion of 2008 had brought an end to that bubble. It turns out, that such was not (yet) the case. Prof. Wray notes that "the crisis [of 2008] wiped out real estate markets and the economy. Managed money needed another bubble. They whipped up irrational fears of hyperinflation that supposedly would be caused by Helicopter Ben’s QE1, QE2, and the newly announced QE3 [aka "The Twist"] Better run to good "inflation hedges" like gold and other commodities. That did the trick. The commodities speculative bubble resumed." Back in 2005 this writer listened to one, Frank Veneroso… a venerated voice among commodity fans. He spoke in Zurich, Switzerland to an incredulous audience about the coming "nuclear winter" in base metals. Of course, "summer" lasted until 2008 and then it came back again, for another three-year run. But Mr. Veneroso had seized upon a very important fact; you cannot have rising stockpiles of something while also having incessant price gains in same. Supply and demand went out the window, temporarily, as a determining factor for prices. Often, that occurrence is thought of as a bubble. "Yes, commodity bubbles happen, but eventually reality sets in and brings the price back down to reality. You don’t get 3, 4, and 5 standard deviation events. A four standard deviation price rise falls outside 99.994% of all outcomes—one in 100,000 years; a five standard deviation price rise is about one in 2 million years. That pretty much covers the time since our ancestors beat things with big sticks," concludes Prof. Wray. Could the "Veneroso Winter" be in the cards? Stay tuned. If it is, you might wish to pull out your heaviest financial "parka." In The Lead – Dot-Com…modity Bubble?